I believe in Marat, the almighty, the Creator of freedom and equality, our hope, who strikes terror into the aristocracy, who has gone forth from the heart of the nation and is revealed in the Revolution, who was murdered by the enemies of the Republic, who poured forth upon us the breath of freedom, who has descended into the Elysian Fields, whence he will one day return to judge and condemn the aristocracy. of the Revolution as seen from abroad. Jean-Paul Marat was sitting in the bathtub when his last hour struck on 13 July 1793. A teacher of languages, a journalist and a physician, Marat had turned out to be one of the most radical demagogues the 1789 Revolution produced. He spent much time in the tub to find relief from a chronic, itchy rash. He wore compresses on his forehead to relieve headaches from which he also suffered. While he was bathing on that fateful day, he was reading a letter from Charlotte Corday, the great-granddaughter of the playwright Pierre Corneille. The young noblewoman had tried in vain to gain admittance to Marat. Now she had sent him a letter in which she slyly suggested a tete-a-tete. He let her in and she stabbed him. Marat died instantly. Some contemporaries must have been pleased at the deed. Marat had been a tough customer. 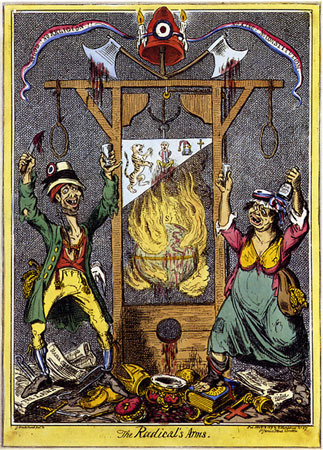 He had had 860 gallows erected to deal with his political enemies and had sent over 200,000 of them to the guillotine. His opponents may have considered his death a just revenge. His adherents, however, celebrated him as the martyr of a just cause. 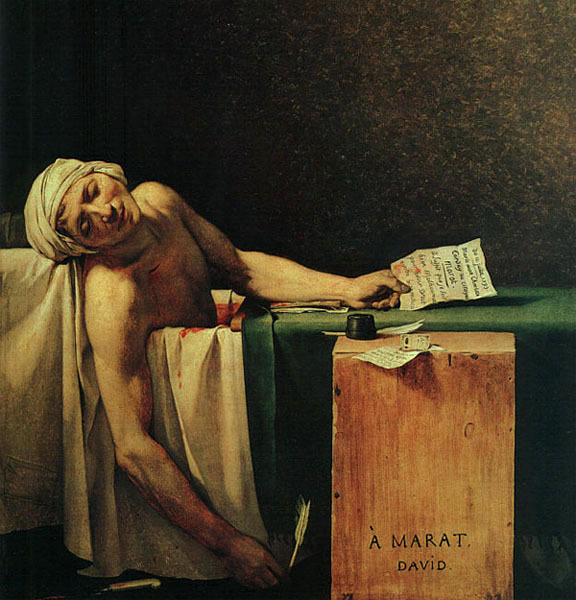 Appointed master of ceremonies at the hero's funeral, painter Jacques-Louis David was a fervent revolutionary and a personal friend of Marat. He obliged by putting Marat's corpse on canvas just as he had had it put on display: with his bare chest and wounds visible. 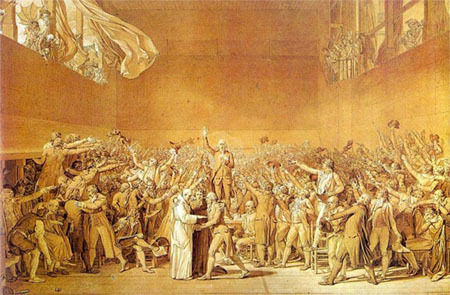 On 15 October 1793 David presented the picture to the National Assembly. 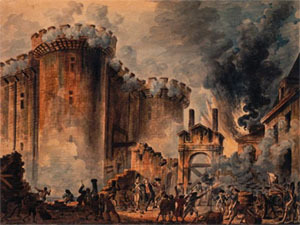 It became the symbol of the French Revolution. Copies of it were placed on church altars, smothered under billowing clouds of incense. Even in public offices copies of the painting were supposed to replace Crucifixes and royal portraits. 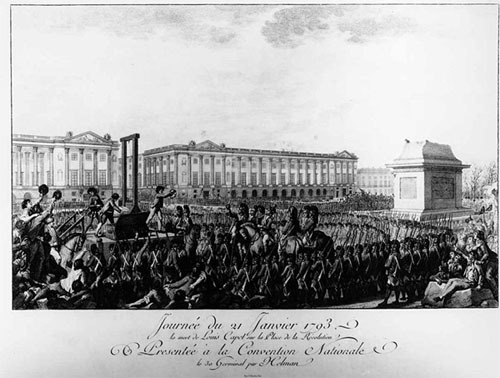 However, before it could get out of hand, the personality cult was stopped by Robespierre's fall and the arrest of Jacques-Louis David. On 10 February the painting was removed from the chamber of the National Assembly. Marat's heart, which had been kept in the Cordeliers Club, was burnt and the ashes scattered in the Montmartre sewer.